These songs are available to buy from emusic.com. Siobhan Long, The Irish Times, Friday July 1st 2005. "Raggedy as Reynardine's first album is, it's a slow burner that insinuates itself beneath the skin on repeated exposure, fuelled mainly by the band's unapologetic love of storytelling, and by Aideen Morrissey's lateral-thinking cello. Kevin Branigan's vocals may not register as sublime, but they bask in the wide open prairie spaces of the title song, a tale of nature's triumph whose unself-conscious, naive delivery surely owes a smidgen of kinship to Nick Drake. 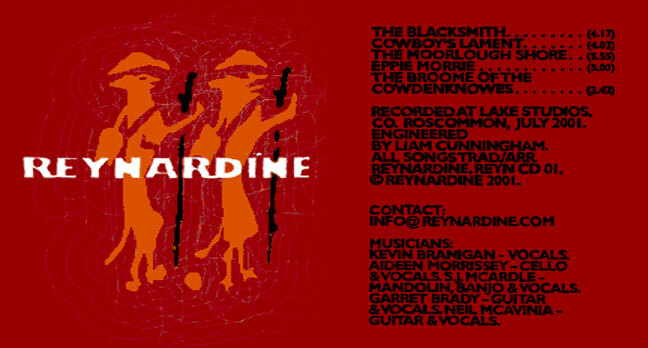 Reynardine relish the gold-digging that produces such gemstones as Maids of Valparaiso, the story dictating the pace, each memorable verse of seafaring derring-do underscored by a judicious melding of fiddle, harp and guitar. Only Gordon Lightfoot's Early Morning Rain falters under the weight of a ponderous pace and self-conscious reading." Sarah McQuaid, Hot Press, August 2005. 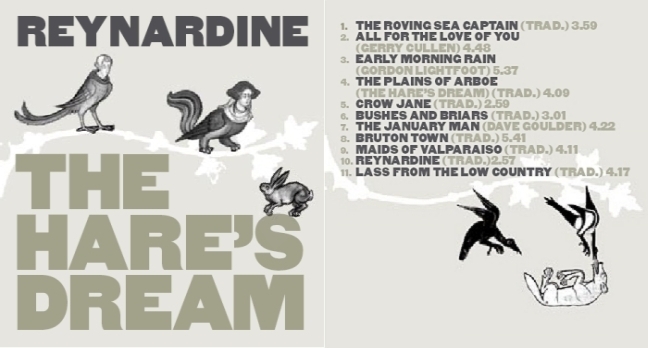 "Reynardine are a Drogheda four-piece that brought out an EP a few years ago; 'The Hare's Dream' is their first album. Guitarist and harmonica player Garret Brady, fiddler Kevin Branigan, harpist/cellist Aideen Morrissey and guitarist Neil McAvinia share vocal duties, trading places in the spotlight and contributing harmonies to each other's songs. The result can be uneven in places, but is knitted together by a delicate touch and a gentle, unassuming sensibility. High points include Brady's low-key interpretation of 'All For The Love Of You', written by The Voice Squad's Gerry Cullen, and McAvinia's falsetto blues on 'Crow Jane'." Liam Smith, Foggy Notions Nov./Dec. 2005. 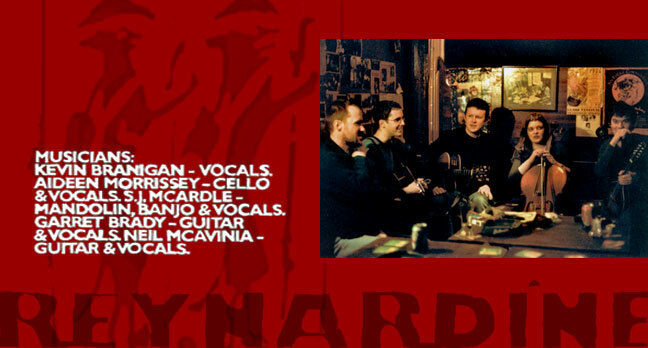 "This Drogheda based group love a good tune, and have put plenty on their first full length album. As well as modern songs by Gerry Cullen, Dave Goulder, and Gordon Lightfoot, they plunder the traditional repertoire from home and abroad. They can put across rousing pieces like "The Roving Sea Captain" as well as delicate ones like "Bushes and Briars" through their canny use of early seventies folk techniques - picking that recalls Joni Mitchell or doomy atmosphere like Nick Drake and Richard Thompson. There's a lovely elemental feel to the music - earthy, airy, salty. The album stresses the great message of the folk tradition: never trust the toffs. The hare of the album's title, who "ne'er wronged mankind", gets torn apart by dogs in a hunt, the serving lad from "Bruton Town" is murdered by his sweetheart's brothers, and the "Lass from the Low Country" is spurned by her lord of high degree. Better to stick with "The Maids of Valparaiso", who won't pawn your clothes when you run out of beer money. The band's four part harmonies are a highlight of their live shows, and it's disappointing that they're used sparingly on the album (notably on "The Plains of Arboe"). 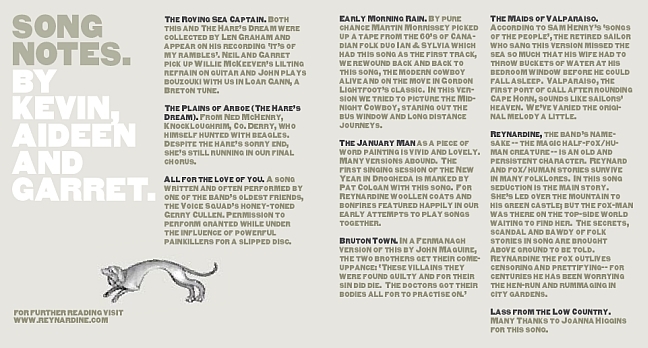 Nonetheless, you'll hear some well chosen, stirringly sung and played music on The Hare's Dream." All reviews used by permission.